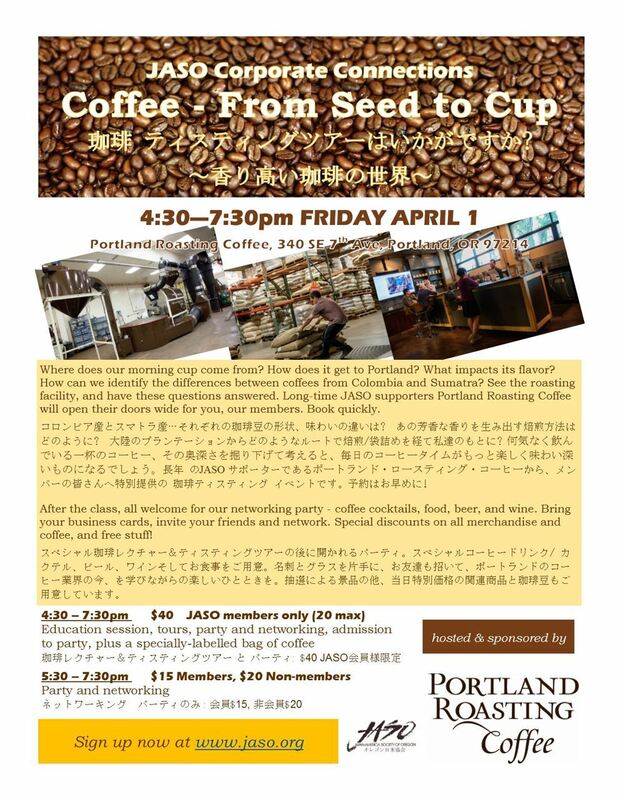 Japan-America Society of Oregon - Corporate Connections: The Coffee Industry from Seed to Cup! Corporate Connections: The Coffee Industry from Seed to Cup! Learn everything you ever wanted to know about coffee, tour the facility, network, and party with food, beer, wine and coffee cocktails! You must be a member in good-standing to sign up for this. ONLY 20 spots available! A great way to meet other JASO members and friends. Exchange business cards while enjoying food, beer, wine and coffee cocktails. Prizes and special discounts on all merchandise available. Join our networking party - special coffee cocktails, plenty of food, beer, and wine. Bring your business cards, invite your friends. Discover not just coffee, but also why the Japan-US relationship is so important to our community. How can we really recognize the difference between Columbian and Sumatran? What does a coffee bean actually look like – or taste like? Where does coffee flavor come from? How does the bean travel from a different continent to our area, and how does it end up in our cup? Can we really purchase “responsibly”? What are the newest developments in the industry, what will we see in the future, and what are the major challenges? How does the coffee travel through a roasting facility and end up in a bag? Long-time JASO supporters Portland Roasting Coffee throw their doors wide open for you, our members. Book quickly. 長年 のJASO サポーターであるポートランド・ロースティング・コーヒーから、メンバーの皆さんへ特別提供の 珈琲ティスティング イベントです。予約はお早めに! After the class, all welcome for our networking party - special coffee cocktails, plenty of food, beer, and wine. Bring your business cards, invite your friends and network while discovering Portland’s thriving coffee industry. Prizes and special discounts on all merchandise and coffee.